We were called around 4pm after reports that four men were fighting in the road near the Tesco supermarket. Some reports also suggested that weapons had been seen. Armed officers were deployed as a precaution. It is not believed that there was ever any threat to the wider community during the incident. 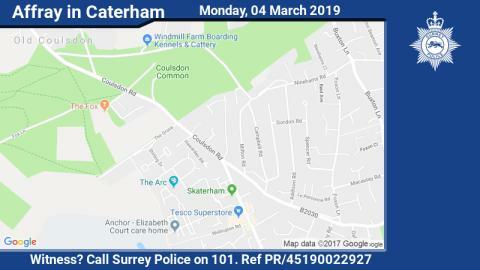 A 35-year-old man from Caterham and a 33-year-old man from Croydon were arrested on suspicion of affray and possession of an offensive weapon. Both men have been released under investigation whilst enquiries continue. We are appealing to anyone who witnessed the incident, or with any phone or video footage, to come forward straightaway as you may be able to help us with our investigation.